Kroo Ba Prohmajak (2441 BE – 2527 BE) was one of the top Lanna Masters of the last Century, whose amulets and Krueang Rang Occult Talismans are as legendary as they are rare to come across. An authentic classic olden days Lanna talismanic charm that can be considered an extremely rare opportunity to acquire. Pra Suprohmaya Thaera (Kroo Ba Prohma Prohma Jakko), or, ‘Kroo Ba Prohmajak’, of Wat Pra Puttabat Tak Pha, in Tambon Makok, Amphoe Pha Chang, Lampun, was born with the name Porhma Pimsarn, on a Tuesday the 30th of August 2441 BE, which was a full moon of the tenth Lunar Calendar Month, in the Year of the Dog. His Parents were named Mr. Bpeng Pimsarn, and Mrs. Bua Thā Pimsarn.. He was the 7th son of a family of 13 Siblings. It is important to note that some of his Siblings also became Great mastert Monks in their own right, namely Kroo Ba Intr Jak Raksa (Pra Sutamma Yan Thēra), and Kroo Ba Kampira, (Wat Doi Noi). His parents were Farmers, but were not overly poor, and had enough resources to live without extreme hardships. Kroo Ba Prohmajak lived with Sila (precepts), helping to tend the farm, tilling the land, but refraining from hunting birds and animals. He and his family only farmed the fields, abstaining from breaking the first precept of not killing living beings. The also did not rear pigs, oxen, ducks or chickens to sell at market, abstaining from indirect killing. His parents were good Buddhists and would take the family to sleep at the temple on holy days, and chant prayers and give alms, and meditate. 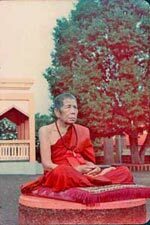 During his childhood, Kroo Ba Prohmajak’s father ordained into the Sangha, and remained ordained until his passing in 2484 BE at the age of 90. When his father ordained, his mother also ordained as a Nun and remained in the temple until she passed away in 2477 BE at age 70. Luang Phu Kroo Ba Prohmajak was able to learn the Sacred Ancient Lanna type Khom Agkhara Sanskrit lettering at a very young age. He learned the script with his older brother, who had been ordained, learned Wicha, and disrobed to return to the household. He thus taught what he had learned to Kroo Ba Prohmajak. This was common for children to learn from each other and from their elders, as in those days not many schools were to be found in the countryside, and most people would have to rely on sharing knowledge. Kroo Ba Prohmajak was able to learn the Lanna Agkhgara from his brother to the point where he could read and write it with sufficient proficiency. 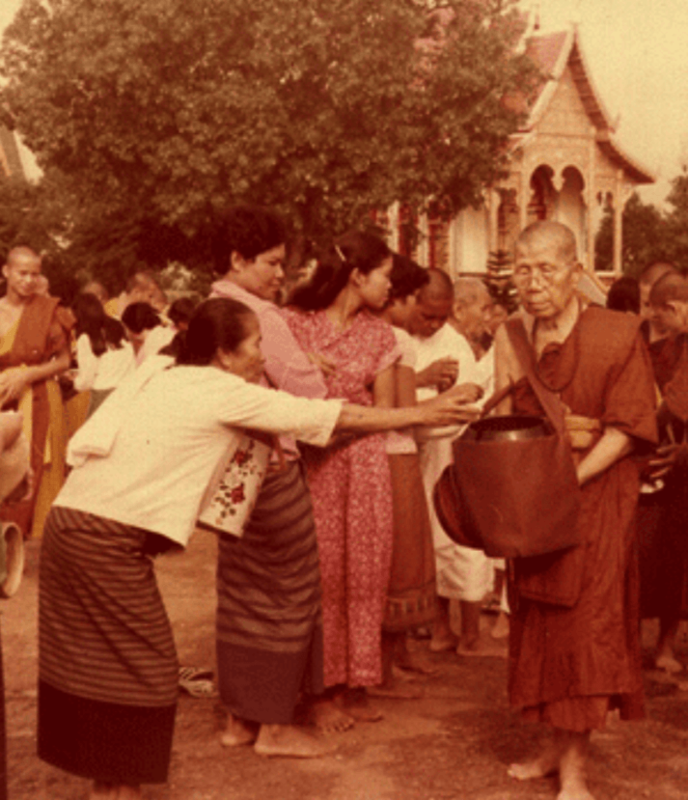 In the time his parents were still alive, Kroo Ba Prohmajak would see many Samanera Novice Monks practicing during the family visits to the temple to practice Dhamma. 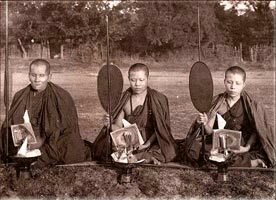 He noticed their orderly conduct and well trained peaceful manner and purity of precepts, and was filled with faith in the Buddha-Dhamma, and felt highly attracted to the idea of ordination. Kroo Ba Prohmajak had also seen a few of his brothers ordain and saw their achievements, and was filled with faith in the Buddha Sasana. In the Year 2455 BE, which was just at the end of the first world wartime, the folk of the land and indeed the world were suffering famines and poverty, and there were also terrible droughts and floods interspersed which caused the folk of Lampun to be without enough food and sustenance. Kroo Ba Prohmajak saw many of the youth fleeing to the temples to ordain, some to escape the hunger at home, and others to escape military call-up to the War, and of course the wisest ones, Ordaining to escape the cause of suffering, and attain Buddhahood. There seemed to be both worldly and spiritual reasons for ordination.On the 14th April 2455 BE, at 5 am, at the age of 15 years old, Kroo Ba Prohmajak approached the Uposatha Shrineroom carrying the saffron robes of a monk to undergo ordination. His brothers who had ordained before him assisted to don the robes, and Luang Phu Kroo Ba Prohmajak looked down at the Gāsāwapat (Thai name for Kasaya saffron dyed robes), which appeared like the victory flag of the Arahants, and felt a very superb and subtle rapture arising within him. He was filled with Faith and Rapture in the thought that he was supremely lucky to have been able to be born as a Human Being, encounter the Buddha-Dhamma, and Ordain as a Monk, to dedicate his life to Buddhism, and follow the path to Enlightenment. 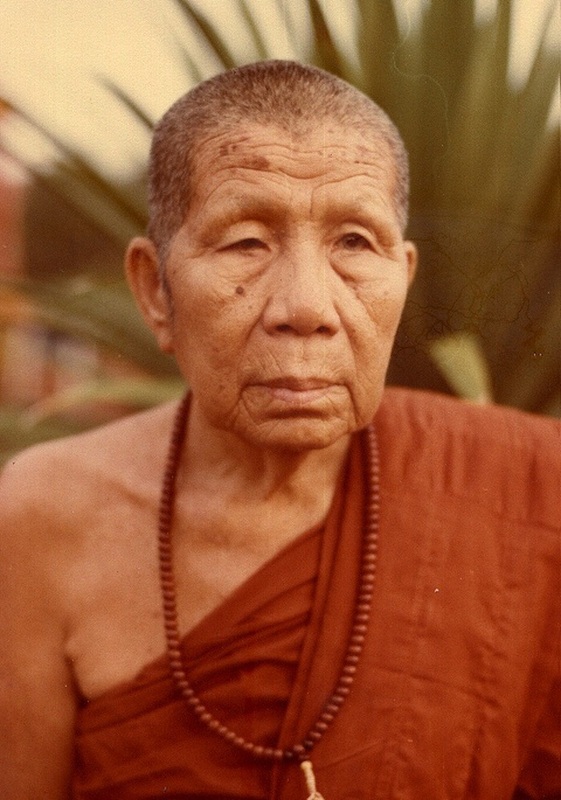 Once he had ordained, his Upachaya Kroo Ba Ajarn, who was very strict and self attained in the Dhamma Vinaya (keeping the rules of the Buddhist Canon), and exerted influence on Kroo Ba Prohmajak to practice the Silajarn Wat, and restrain the Kilesas, by practicing a well kept and organised regime of practice, and to restrain oneself from outwardly expression of emotion, or views. Kroo Ba Prohmajak looked at the blackboard and the tiny lettering in Lanna he had to read and copy, and began to worry if he would ever be able to memorise them all. But as he began to practice, he found that he was able to finish the inscriptions to fill exactly one full blackboard a day, and gained confidence. He kept the Mai Gradan Sacred Blackboard of Inscription as a Momento. During his practice, Kroo Ba Prohmajak would always avoid the company of other Monks, even when he would eat, he would eat alone. Because Kroo Ba Prohmajak was still a young Samanera Novice monk, he also studied at the state school, up to the 4th class of primary level. In the year 2459, during the ‘Khao Pansa’ rainy retreats, a Dhamma University for Monks was opened at Wat Chang Khaw Noi Nuea, a few Kilometers away. Kroo Ba Prohmajak would travel there every day to study and gain knowledge. Once the rainy retreat was over, he moved to stay at Wat Chang Khao Noi Nuea, to further his studies in Dhamma and to learn Wicha. On the 16th January 2461 BE, Kroo Ba Prohmajak had reached adulthood, and ordained up a step from Samanera, to fully fledged Bhikkhu, at the age of 20 years old. He was ordained at Wat Pha Hiang, in Pha Chang, Lampun. Pra Atigarn Gaew Khadtiyo (Kroo Ba Khadtiya) was his Upachaya Ordaining Officer. Pra Ajarn Hon was his Gammawajajarn Prompting Officer, and Pra Ajarn Som Suwinto was his Pra Anusawanajarn Witness. He was given the ‘Chāyā’ (Monk’s Surname) of ‘Prohmajako’, meaning ‘Brahma Chakra’ (Cosmic Disk of Brahma). As soon as he had become a fully fledged Bhiikkhu he began to apply extreme diligence to his practice and his studies. In the year 2462 BE, there was a mass examination for Degrees in Dhamma, and over 100 Monks traveled to try to pass them. 11 monks from Lampun were present, including Kroo Ba Prohmajak. Once the results of the exams came out, it turned out that only two monks of the 100 who had entered, had passed the exam, one of them being Kroo Ba Prohmajak, and the other one being Luang Por Pra Tong Kam, of Wat Chetupon. 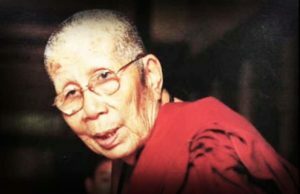 Kroo Ba Prohmajak was the first monk from Lampun in HIstory to ever pass the exam. Kroo Ba Prohmajak then asked Pra Maha Nayok for the chance to go and continue studies in Bangkok, but he was unable to get permission to go. 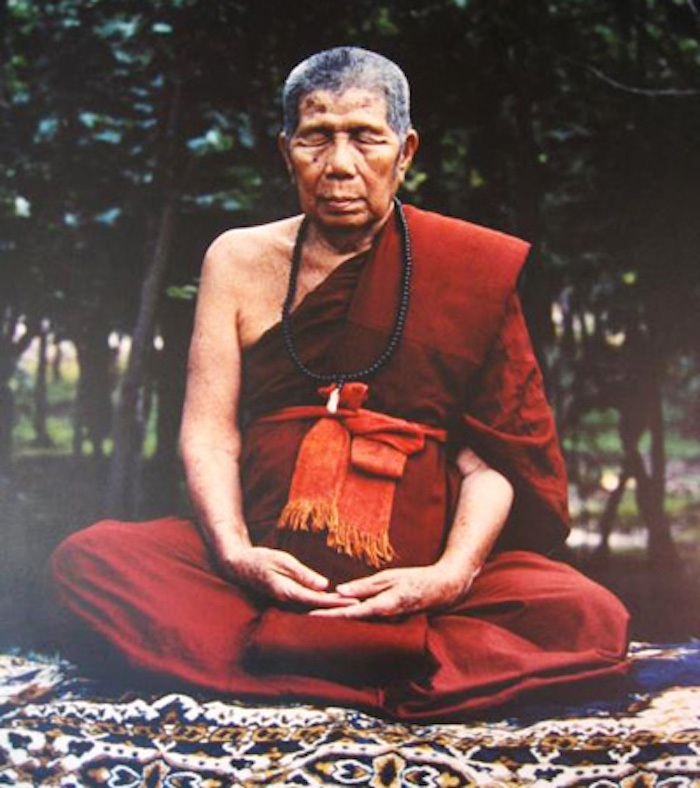 He remembered the words of is Kroo Ba Ajarn ‘If you love yourself, then you should focus on the Dhamma practice’, and Kroo Ba Prohmajak decided he would focus hard on learning from the inner practice of Meditation and Vipassana. He began to travel and maintain restraints of Vinaya throughout, as he wandered and met many great Kroo Ba Ajarn who shared their Wicha and Wisdom. Some of the more well known Kroo Ba Ajarn he met and received Wicha from were lb Hwan Maha Wano, Pra Kroo Intajako (both his older brothers), Kroo Ba Saen Yanawuti (Wat Nong Ngueak), Kroo Ba Bun Ma Baramee (Wat Gor Muang), Kroo Ba Un (Wat Panich). 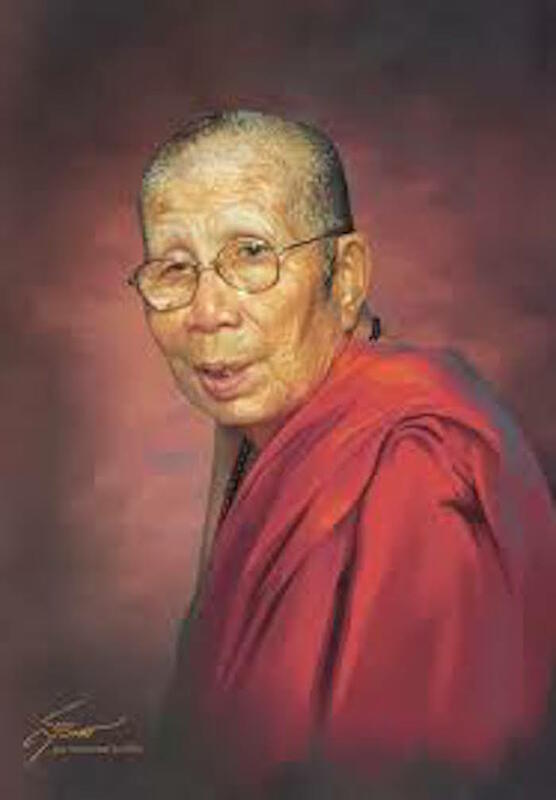 As the years passed, Kroo Ba Prohmajak developed his understanding of the Buddha-Dhamma thorugh introspection and contemplative mindfulness, and began to feel dispassion with the world, and the existential question, the impermanence in life, and of life itself, and he became ever more fully focused on what seemed to be the only path. In the year 2464 BE, Kroo Ba Prohmajak asked his Upachaya and his Relatives for permission to leave on Tudong Forest Wandering, to gather experience and deepen his practice of the path, and develop the Wicha which can only be attained with the insights attained iin Tudong Practice. He received permission, and set off in the direction of Doi Noi mountain near the Mae Nam Ping riverbanks in Chiang Mai, which was about a tweve Kilometer trek through the Jungle. One Samaera came with him (Samanera Un Ruean – later to become Pra Ajarn Luang Por Ruean of Wat Ban Hway). Later on in the Tudong, Luang Por Hwan od Wat Pha Hiang also came along to practice. They all stayed in an old Sala (Pagoda) in the forest together and meditated throughout the nights in the forest, confronting the experiences of Kammathana Vipassana, and Taming their Own Minds and Hearts. They returned to the temple for the rainy retreat, and then once more left to return to the forest when the rainy retreat was over. From here on. Kroo Ba Prohmajak developed and went on to Tudong throughout many provinces in solitarty as well as with his Kroo Ba Ajarn and co-practitioners, and advanced his abilities, for many tens of years. After many decades of Tudong, Kroo Ba Prohmajak came to stay at Wat Pha Nong Chedi in Pha Chang , Lampun, which was an abandoned temple since many years. The local folk asked Kroo Ba Prohmajak to remain there for a while to revive the temple back to life, which he did for a period of 4 years. After this, Kroo Ba Prohmajak went on to Wat Pra Puttabatat Tak Pha, where he stayed for one year. He then wandered onwards to gather experience and seek Wicha, and came to stay at Pha Bpon Mahin forest for one year in solitary. After this, he traveled back to Wat Pha Nong Chedi for a further 2 years. In 2491 BE he traveled back to stay at Wat Pra Puttabat Tak Pha, and remained there from there onwards. He cared for his devotees (Looksit) like they were his own children, and became highly beloved by the devotees of the temple. 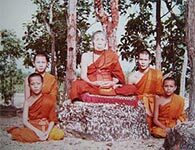 Bit Kroo Ba Prohmajak still held his inclination for Tudong in his heart, and would always pass the sry season taking young Samaneras out into the forest to teach the practices to them, and bestow them with this irrepeatable experience of the 13 Tudong Practices, and Kammathana Vipassana. Kroo Ba Prohmajak was known to never credit some above others, nor to criticise some more than others. In fact, he would not compliment or criticise anybody ever, and would treat everybody with the same loving kindness and compassion. He would always teach with tentative care, slowly revealing the problem without offending, and leading the looksit to understanding the nature and cause of their own problem. Kroo Ba Prohmajak never gathered material objects or personal possessions around him, and remained a simple monk, who lived with neat and tidy sparseness. He attended to the temple maintenance, the welfare and wellbeing of the Samaneras and Bhikkhus, and the Lay Congregation, with Utmost Diligence. 1. FAQ Questions and Answers of Miscellaneous Problems encounters in the Practice. 3. Dhana Sila Bhavana (Generosity, Precepts, and Practice). 4. Quesntions and Answer Book to the book ‘Dhana Sila Bhavana’. 6. Khmer Saranakom. He taught his students to focus on the Sila practice of Moral Conduct and Self Restraint as a base of practice for powerful Samadhi Meditation, which in turn leads to Panya Spiritual Wisdom. He performed many charitable deeds such as the building of the Rong Rian Pra Pariat Dhamma School for Pali Sanskrit students, the creation of a Vipassana Kammathana practice center, and developed the facilities extending the temple of Wat Pra Puttabat Tak Pha, to make it one of the most important Provincial Temples of Lampun. He received immense reverence from the Samaneras, Bhikkhus and Lay Congregation for his purity and selflessness, and the deeds he performed to ease the sufferings and stress of the local people of Lampun. 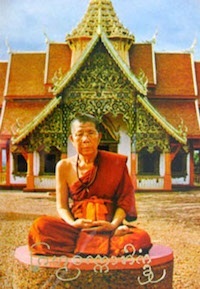 Kroo Ba Prohmajak passed away in meditation posture on the 17th August 2527 BE at 6:00 am at the age of 87 years old. His remains were kept for the devotees to pay respects for three years before he was given a state funeral ceremony and cremation on the 30th January 2531 BE, with HIs Majesty King Bhumiphol Adulyadej and her Majesty Somdej Pra Nang Jao Pra Boroma Rachininath came to inaugurate the ceremony and pay respects. His Majesty performed the lighting of the Funeral Pyre himself in Honour to Kroo Ba Prohmajak. 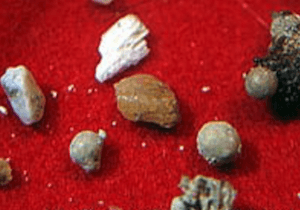 The remains of Kroo Ba Prohmajak have now transformed into ‘Pratat’ (Buddha Relic Crystalline Substance), of various colours, which is seen by Thai Buddhist people to indicate that the monk has attained one of the four levels of Enlightenment. This is what Thai People call ‘Arya Sangha’, meaning a monk or a practitioner who has attained stream entry or above. 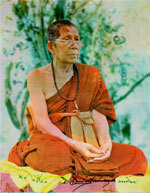 The list of projects and meritorious attainments of Kroo Ba Prohmajak are many and would fill a few pages to recount, but let us say that he constructed and completed a multitude of important projects for lay folk and Buddhist temples, and traveled to teach the Dhamma around the land, giving great teachings which are still remembered and documented for their astuteness, and understandability, and force of truth. HIs teachings would pont the path to Nirodha, the extinguishing of Suffering, and its Causes.